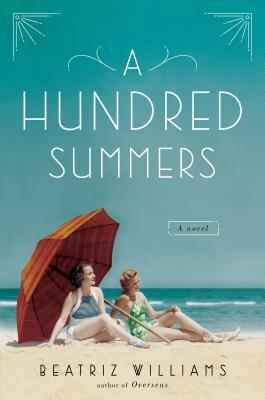 Goodreads says, "Memorial Day, 1938: New York socialite Lily Dane has just returned with her family to the idyllic oceanfront community of Seaview, Rhode Island, expecting another placid summer season among the familiar traditions and friendships that sustained her after heartbreak. That is, until Greenwalds decide to take up residence in Seaview. Nick and Budgie Greenwald are an unwelcome specter from Lily’s past: her former best friend and her former fiancé, now recently married—an event that set off a wildfire of gossip among the elite of Seaview, who have summered together for generations. Budgie’s arrival to restore her family’s old house puts her once more in the center of the community’s social scene, and she insinuates herself back into Lily's friendship with an overpowering talent for seduction...and an alluring acquaintance from their college days, Yankees pitcher Graham Pendleton. But the ties that bind Lily to Nick are too strong and intricate to ignore, and the two are drawn back into long-buried dreams, despite their uneasy secrets and many emotional obligations. Under the scorching summer sun, the unexpected truth of Budgie and Nick’s marriage bubbles to the surface, and as a cataclysmic hurricane barrels unseen up the Atlantic and into New England, Lily and Nick must confront an emotional cyclone of their own, which will change their worlds forever." You had me at Memorial Day and 1938. This book would look great in my beach bag this summer! What do you guys think? Great pick! I will be adding this to my TBR list. Haha, I know, right?! Thanks, Christina! This sounds like a fantastic read! I've been wanting to branch out and read more adult contemporary novels and this sounds like a good one to add to the list. Thanks! I try to mix it up with some adult reads from time to time. Thanks for stopping by! This sounds full of twists and turns, and like a lot of people are hiding a lot of secrets! Great pick! My WoW pick this week is Six-Gun Snow White! Thanks, Kelly! I'll have to check your pick out. Thanks for stopping by. You are my go-to person for beach/summer reads Christina! You always have me wanting it to be July so I can just visit my parents' lake house, sit on their dock and read the summer away:) This seems like it would be perfect for that! Aww. Thanks, Jenny! You know I love my summer reads. Your parents lake house sounds pretty incredible right about now! Thanks for visiting! I have heard a lot of good things about this author, her last book sounded really interesting. It's not often I see some good adult titles on WoW, so thanks for this one! I try to mix it up every once in awhile with some adult reads. Thanks for visiting, Andrea! I know, right?! I love it. Thanks for stopping by, Juju. This sounds great--the cover and the time period are enough to make me pick it up! Oooh, that is really just too gorgeous. It reminds me of The Summer We Read Gatsby, for some reason -- I guess just very evocative of a certain time period. Will be on the look-out for it, too!